Kewê hêşin an jî kevoka qelaç (Columba livia) him li nav malan him jî li çolê meriv dikane bibîne. Li cem Kurdan ew kewekî pîrozwer e. Neçîrvan lê naxin û goştî wî naxwin. ↑ BirdLife International (2012). 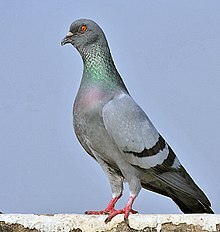 "Columba livia". IUCN Red List of Threatened Species. Version 2012.1. International Union for Conservation of Nature. Retrieved 16 July 2012. ↑ "Columba livia". Integrated Taxonomic Information System. Retrieved 2008-02-23. Ev rûpel cara dawî 3 sermawez 2015, seet li 12:16an de hatiye guherandin.